There is never a good time for your printer to break down. That's the problem! Second Chance is the Solution! Is your company's BUDGET SHRINKING? Get the most for your money with Second Chance Solutions' used and refurbished laser printers. Why haul your laser printer in for repair? Second Chance Solutions offers onsite service and maintenance for LESS! 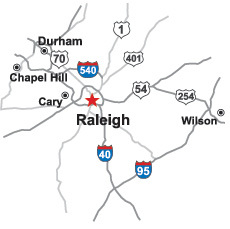 Servicing the Raleigh, Durham, Chapel Hill region in North Carolina, Second Chance Solutions is your Laser Printer Specialist with Repair, Maintenance & Sales with Same Day or Next Day Service! Contact us to learn how Preventive Maintenance is more cost effective than the "do-nothing-until-it-breaks" approach! Second Chance Solutions services the greater RTP, NC area. We have over 30 years experience in computer and printer repair and preventive maintenance, 12 of which have been in the Triangle area. Our employees are trained on a wide variety of printers including HP, Canon, Minolta, Lexmark, IBM, Zebra Bar Code, and Xante. The company's goal is to provide high-quality, on-time service at an economical price. Same day or next day service is as important to us as it is to you. We offer in home and office repair for what most other companies charge for carry-in service. After hours and weekend service is also available. We will keep you printing efficiently! Angier, Apex, Benson, Butner, Carrboro, Cary, Chapel Hill, Clayton, Creedmoor, Dunn, Durham, Fuquay Varina, Garner, Hillsborough, Holly Springs, Knightdale, Louisburg, Morrisville, Pittsboro, Raleigh, Rolesville, Selma, Smithfield, Wake Forest, Wendell, Wilson, Youngsville, and Zebulon. Cigarette smoke can cause a build-up of tar and nicotine inside your printer resulting in paper jams and discoloration of outside plastic covers. © 2019 Second Chance Solutions | All Rights Reserved.